BRAND NEW 18th EDITION IS JUST OFF THE PRESS! 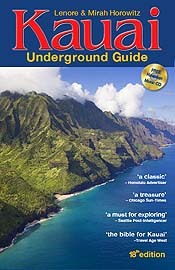 Unbeatable price- only $14.95 includes FREE Hawaiian music CD and FREE bookrate shipping. 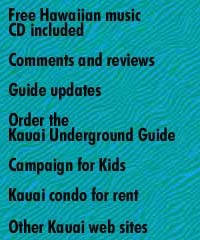 When you buy this book, a portion of the sales price will be donated to charities benefitting Kauais children. Readers at Amazon.Com rate us an average of 5 out of 5 stars! CLICK on the Amazon link above to order online. Or send us an email for your own personalized copy. Quantity discounts for wedding parties or family gatherings - and we can help you make the best arrangements for where to stay and what to do when you get there!